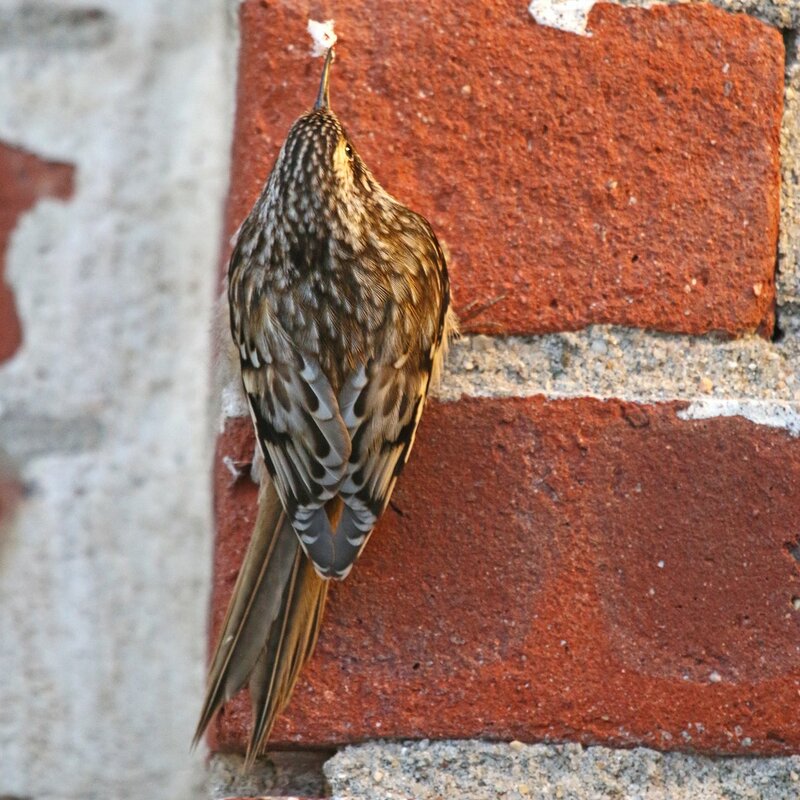 Well maybe it’s just a Brown Creeper on a wall. But that’s still interesting, right? Right? Fine. It’s not anywhere near as interesting as one of those amazing pink-winged Wallcreepers showing up in New York. 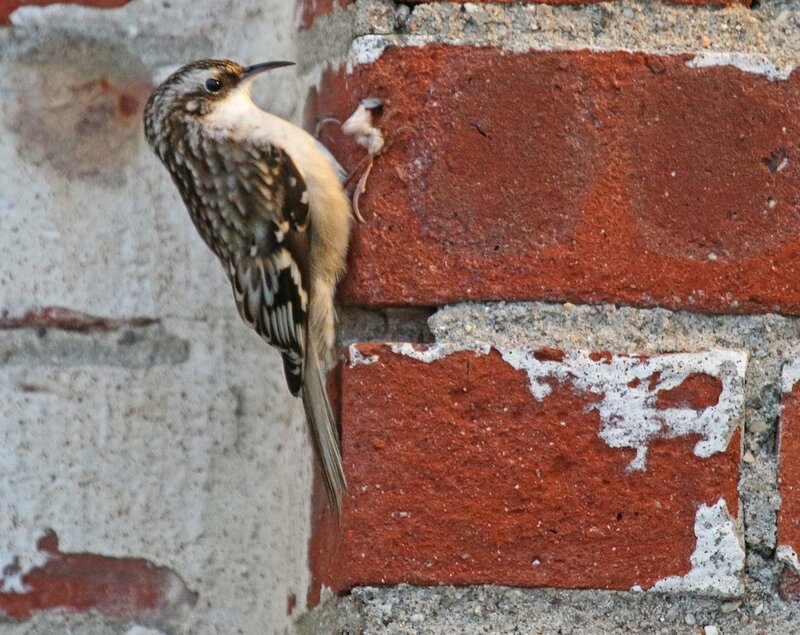 But I was still fascinated by the behavior of this Brown Creeper that I observed in the midst of a driving rainstorm on Saturday morning at Jacob Riis Park in Queens. I was out there doing a seawatch hoping to find something rare going past. Sadly, that didn’t happen, though the sight of large numbers of Northern Gannets and Bonaparte’s Gulls streaming west took the sting out of the lack of rarities. 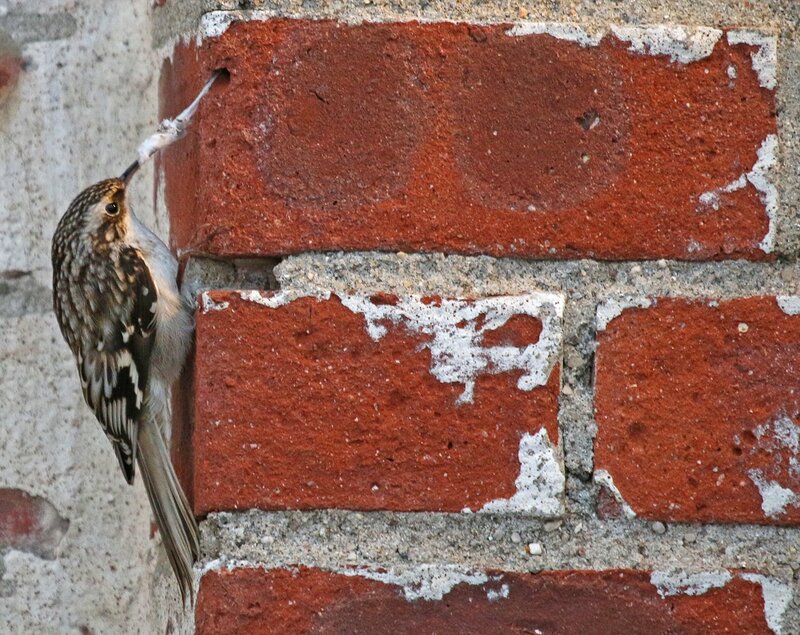 But while I sheltered in an alcove of the bath house, trying to stay out of the wind-driven rain, I was intrigued and amused by the antics of the creeper, which was steadily working up the wall until it reached the top and then flying to the base of the wall a few feet further on and making its way up again. I didn’t think it would find much to eat and it didn’t until it reached a section of wall that had outdoor lighting that was still on in the murky early morning light. I assume the lights were on all night and attracted what bugs were around as the creeper pretty quickly started to find food. I stepped out into the rain to get a better look and was treated to the creeper’s discovery of a large mass of silk stuck in a crevice. I’m not sure what, exactly, was wrapped up in all that silk but it must have been something good! This is stickier than cotton candy! I don’t know what I’m eating but it sure tastes good! There were more pictures but the low light meant low shutter speeds despite bumping up the camera’s ISO and many were motion-blurred. Have any of you ever seen a creeper that has eschewed trees in favor of walls? 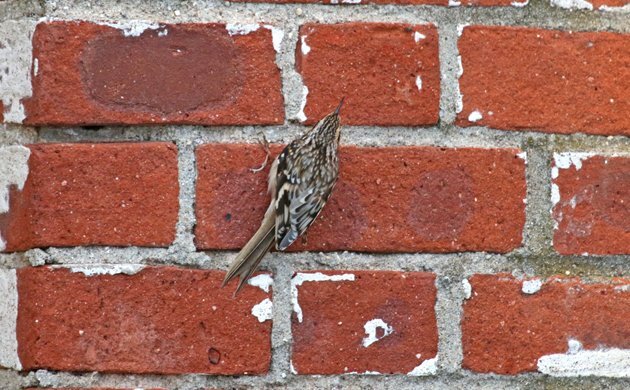 In my not-so-long-gone former life as a Chicago Bird Collision Monitor, I could always count on finding creepers pecking at a low brick wall that separated an office building from a hotel. They also liked to examine the crevices in the building’s metal columns! Cool find! I don’t recall having seen that behavior before. 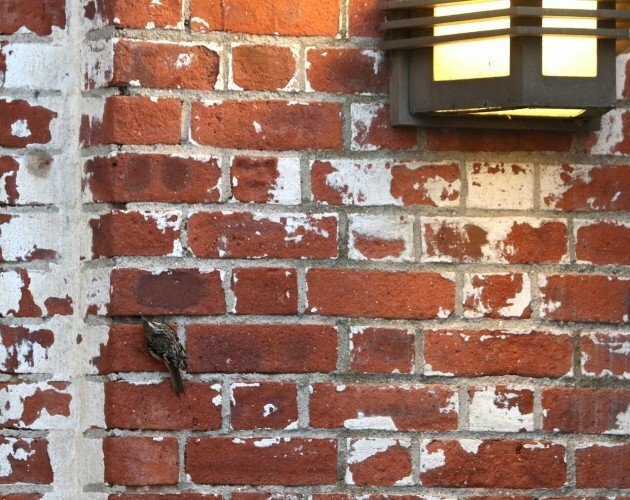 It’s good that birds can make positive use of our lights sometimes. Several years ago I watched a Willie Wagtail (Australian flycatcher) catching moths that came to the low height lights at a campground in central Australia, and watched Common Mynas (unfortunately) sitting close to the cover of an outdoor light on our neighbour’s house on a very cold day. I have not observed that behavior in a creeper, but a few years ago observed a similar behavior from a Yellow-bellied Sapsucker. It was in the afternoon on 56 St bet Lex & 3rd Aves, and the bird was working the sides of the condo buildings. For the life of me I couldn’t figure out what it was eating, but it was busily working away.